Forget-me-not (Myosotis spp. ): growing, planting, caring. Easy, cute little flowers, and you an actually forget to water them! Scientific name : Myosotis spp. 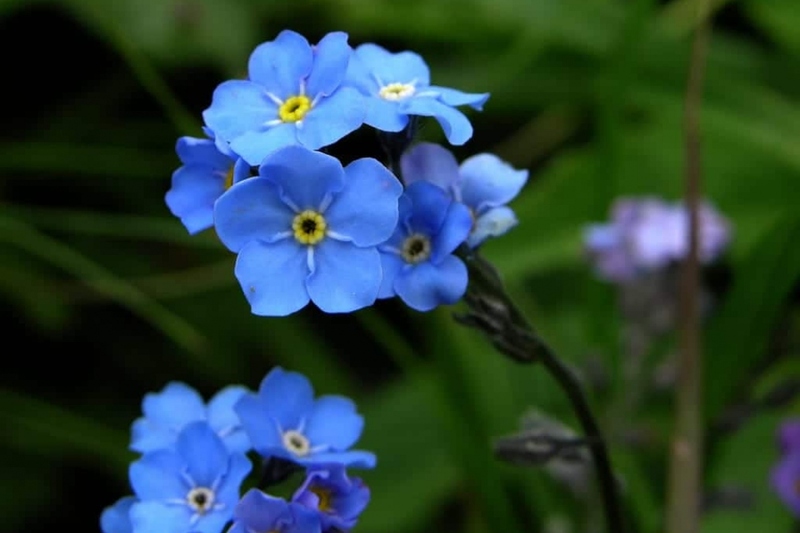 Myosotis - Forget-me-not or Scorpion grass - is a genus of flowering plants in the family Boraginaceae. They are short-lived herbaceous perennials or biennials growing to 12–30 cm (5–12 in) tall with hairy leaves and a many intensely sky-blue flowers with yellow centres in Spring. Some cultivars are on the market though, like M. sylva 'Rosylva' with pink flowers, or M. palustris 'Ice Pearl' with white icy ones. Seeding is carried out in the nursery from June to early September, or in open soil in August. In nursery, choose a protected, shaded place. The temperature should ideally be between 15 and 20 ° C. Fill the box with "special seedlings" potting soil. Tamp the potting soil and sow the seeds on the whole surface. Cover it with a thin layer of potting soil (1 mm). Water gently. The substrate must remain moist during the entire period of emergence. Plant out in a bucket once the plants have developed some leaves. You should wait until fall to plant in open soil. In August, sow in the ground, spread it on the whole surface and water gently. Once the plants have reached a few centimeters, you should thin them out and keep only the most beautiful every 15 to 30 cm. If you did not sow them directly in open soil, about two months after sowing, the plants took enough strength to be placed in open soil. Myosotis prefers a sunny location in temperate or semi-shaded areas in warm regions. It enjoys a rich, fresh soil, well drained and if possible enriched with a manure fertilizer. Plant them in finely worked beds (spaded, scratched and raked), checking that the last spring frosts are overdue. Once the area is properly prepared, simply make a small hole with a dibble, remove the plant from its bucket, put it in the hole, and compact the soil to put it in contact with the roots. Respect a spacing between the plants corresponding to one third of its intended width. Water copiously to facilitate rooting. In pots: opt for a pierced pot to ensure good drainage. Line the bottom of the pot with clay balls or gravel. Fill half of the pot with potting soil. Arrange the plants with a space of 15 cm between them. Cover with potting soil, tamp well and water. Forget-me-nots, in pots or planters, will appreciate in the spring some inflow of liquid fertilizer for flowering plants, diluted in the water of irrigation, every 2 to 3 weeks. Forget-me-not does not need a lot of water. Outside the periods of sowing, transplanting or drought, watering is useless. In pots or planters, provide regular watering but do not let the water stagnate in the saucer. The forget-me-not is invasive and spontaneously reseeds. It is possible to recover seeds that are found in the small pods appearing after flowering. Once the flower stalk is dried and the pods open, cut the flower stalk and shake it where you want to see forget-me-not flowers next year.